This lecture series features guest speakers with interdisciplinary expertise across the health sciences who discuss contemporary issues related to diversity and inclusion in research, practice, and academia. The College of Health Sciences Office of Diversity and Inclusion and the UCI Center on Law, Equality, and Race (CLEAR) proudly hosted Drs. Kimani Paul-Emile and Alicia Fernandez on February 13, 2019. Drs. 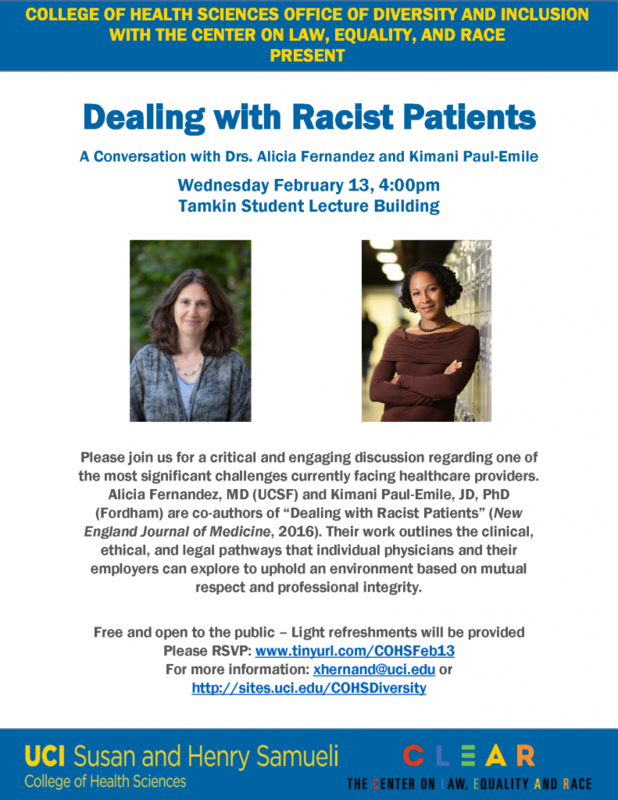 Paul-Emile (Fordham University) and Fernandez (UCSF) are co-authors of “Dealing with Racist Patients” along with Alexander K. Smith and Bernard Lo. The article, published in the New England Journal of Medicine in February 2016, is in the 99th percentile of most viewed articles from the journal. Full video of the event can be found here. Please be on the lookout for further keynote talks every quarter as part of our ongoing Health Equity and Diversity Lecture Series. The UCI Susan and Henry Samueli College of Health Sciences’ (COHS) Health Equity and Diversity Symposium provides students, residents and fellows, faculty, healthcare professionals and community members with an opportunity to explore innovative strategies to combat health disparities in the United States and around the globe. The inaugural Health Equity and Diversity Symposium was held in October 2018. Led by keynote speaker Dr. David Acosta of the Association of American Medical Colleges, the event also featured an array of speakers from multiple disciplines who utilize their diverse academic and professional perspectives to benefit research and practice in the health sciences. The program booklet for the 2018 symposium can be found here. The program contains detailed information about our speakers and their areas of expertise. Videos from the event are also available at the following links. 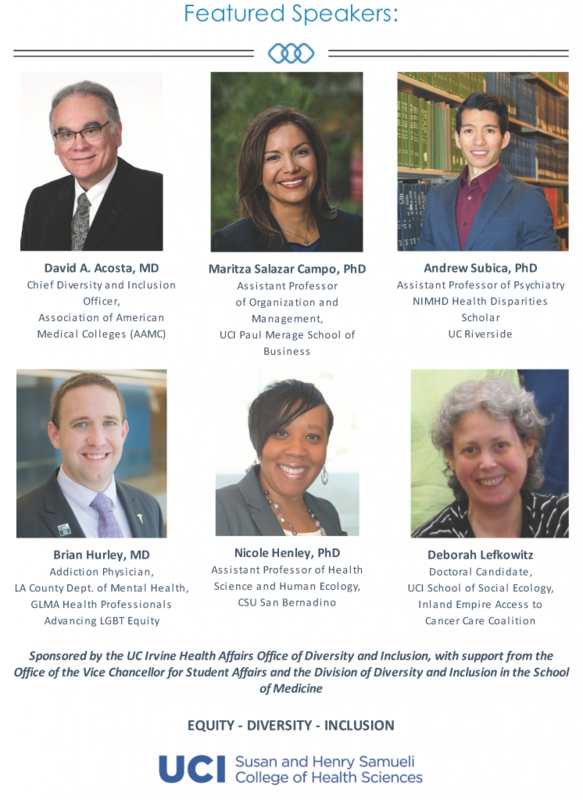 Please be on the lookout for the 2nd annual UCI COHS Health Equity and Diversity Symposium in Fall 2019.